24 10/100/1000 ports (24 PoE ports with 100W power budget), 2 Gigabit copper/SFP combo ports, 12Mb Packet Buffer, 440 x 44 x 257 mm ONLY WHILE STOCKS LAST! In today's hyper-connected world, reliable access to network resources is critical to all businesses. However, you also need to invest wisely to stay competitive, knowing how to separate the essential from the extraneous and get the most value for your dollar. For investment in network infrastructure, building a solid foundation for your business is essential, but it doesn’t mean you need the most advanced feature set on the market. For businesses requiring high performance, advanced security, and rich manageability from the network, fully managed switches are an excellent choice. However, they also typically come with high price tags. Smart switches provide the right level of network features and capabilities for growing businesses at a lower price, so you’ll have more dollars to put toward other areas of your business. With Cisco® 250 Series Smart Switches (Figure 1), you can achieve business-class network performance and security without paying for advanced network features that you will not use. When you need a reliable solution to share online resources and connect computers, phones, and wireless access points, but low cost is a top priority, Cisco 250 Series Smart Switches provide the ideal solution. High-speed desktop connectivity: Cisco 250 Series switches can quickly and securely connect employees working in small offices with one another and with all of the printers, servers, and other devices they use. High performance and reliable connectivity help speed up file transfers and data processing, improve network uptime, and keep your employees productive. Flexible wireless connectivity: Cisco 250 Series switches work with Cisco and third-party wireless solutions to extend the reach of your network. With security features, Power over Ethernet (PoE), VLAN, and QoS, these switches are the perfect foundation to add business-grade wireless to a network. Unified communications: The Cisco 250 Series provides QoS features to enable you to prioritize delay-sensitive traffic in your network and let you converge all of your communications solutions such as IP telephony and video surveillance onto a single Ethernet network. Cisco offers a complete portfolio of IP telephony and other unified communications products designed for small businesses, and Cisco 250 Series switches have been rigorously tested to help ensure easy integration and full compatibility with these and other vendor products. Smart Network Application (SNA) is an innovative network-level monitoring and management tool embedded in the Cisco 100 to 500 Series switches. It can discover network topology, display link status, monitor events, apply configurations, and upgrade software images across multiple switches in the network. The FindIT Network Manager and Probe are designed to manage Cisco 100 to 500 Series switches, routers, and wireless access points. They let you proactively manage the network instead of just reacting to events. FindIT Network Management is the perfect addition to your business's network. For more information, visit https://www.cisco.com/c/en/us/products/cloud-systems-management/findit-network-management/index.html. The FindIT Network Discovery Utility works through a simple toolbar on the user’s web browser to discover Cisco devices on the network and display basic device information, inventory, and new firmware updates to aid in the configuration and speed the deployment of Cisco Small Business products. For more information, visit https://www.cisco.com/c/en/us/products/cloud-systems-management/small-business-findit-network-discovery-utility/index.html. Simple or advanced-mode graphic user interfaces reduce the time required to deploy, troubleshoot, and manage the network. Configuration wizards simplify the most common configuration tasks and provide the ultimate tool for anyone to set up and manage the network. Cisco Smartports technology provides more advanced capabilities and hands-on control by automatically configuring ports with specific levels of security, QoS, and availability according to the type of connected device, based on Cisco best practices and pretested configurations. The Auto Smartports feature automatically applies the intelligence delivered through the Smartports roles to the port based on the device types discovered over Cisco Discovery Protocol or LLDP-MED. This capability facilitates zero-touch deployments. The USB port on the front panel of the switch enables easy image and configuration transfer for faster deployment or upgrades. Reliability and performance: Cisco 250 Series switches have been tested to deliver the high performance and reliability you would expect from a Cisco switch and help you prevent costly downtime. The switches speed file transfer times, improve slow and sluggish networks, keep your vital business applications available, and help your employees respond more quickly to customers and each other. With a network based on Cisco 250 Series switches, you can address all of your business communications and connectivity needs and reduce the total cost of ownership of your technology infrastructure. Cisco 250 Series switches also support 10 Gigabit Ethernet uplinks on select models, so you can build a high-performance and future-ready network to support your thriving business. Layer 3 static routing: This capability allows you to segment your network into separate workgroups and communicate across VLANs without degrading application performance. As a result, you can manage internal routing with your switches and dedicate your router to external traffic and security, helping your network run more efficiently. 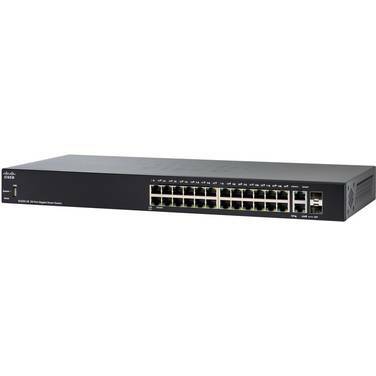 Power over Ethernet Plus (PoE+): Cisco 250 Series switches are available with PoE+ on both Fast Ethernet and Gigabit Ethernet models. This capability simplifies the deployment of IP telephony, wireless, video surveillance, and other solutions by allowing you to send data and power to network endpoints over the single network cable, eliminating the need for separate power supplies or outlets. PoE+ provides up to 30W of power per port, enabling deployments for 802.11ac wireless access points, Pan-Tilt-Zoom (PTZ) IP cameras, videophones, and thin client devices, delivering more flexibility and investment protection. PoE powered device and PoE pass-through: The 10-port compact models of Cisco 250 Series can work as PoE powered devices and draw power from upstream PoE switches in the wiring closet, simplifying the deployment in meeting rooms, classrooms, hotel rooms, and other flexible locations. Each switch can accept up to 60W of power per uplink port to power itself and pass through the power to the downstream PoE end devices if needed. Network security: Cisco 250 Series switches provide the security and network management features you need to maintain a high level of security for your business, keep unauthorized users off the network, and protect your business data. The switches include integrated network security to reduce the risk of a security breach, with IEEE 802.1X port security to control access to your network, Denial-of-Service (DoS) attack prevention to increase network uptime during an attack, and extensive Access Control Lists (ACLs) to protect sensitive portions of the network from unauthorized users and guard against network attacks. IPv6 support: As the IP network addressing scheme evolves to accommodate more devices, you can have peace of mind that your network is ready. Cisco 250 Series switches provide native support for IPv6 alongside traditional IPv4. With USGv6 and IPv6 Gold Logo certifications, the 250 Series will enable you to take full advantage of IPv6-enabled operating systems and applications in the future, without having to upgrade your network equipment. IP telephony support: Cisco 250 Series switches include QoS features to prioritize delay-sensitive services such as voice and video, simplify unified communications deployments, and help ensure consistent network performance for all services. Networkwide automatic voice deployment: Using a combination of Cisco Discovery Protocol, LLDP-MED, Auto Smartports, and Voice Services Discovery Protocol (VSDP, a unique, patented Cisco protocol), customers can deploy an end-to-end voice network dynamically. The switches in the network automatically converge into a single voice VLAN and set of QoS parameters and then propagate them out to the phones on the ports where they are discovered. For example, automated voice VLAN capabilities let you plug any IP phone (including third-party phones) into your IP telephony network and receive an immediate dial tone. The switch automatically configures the device with the right VLAN and QoS parameters to prioritize voice traffic. Limited lifetime warranty: The Cisco 250 Series switches come with the Cisco limited lifetime hardware warranty, with return-to-factory replacement, software updates for bug fixes for the warranty term, and 1-year limited warranty for fans and power supplies. In addition, Cisco offers telephone technical support at no charge for the first 12 months following the date of purchase. To download software updates, go to https://www.cisco.com/cisco/web/download/index.html. World-class support: To extend the support coverage beyond the warranty provisions, choose Cisco Smart Net Total Care™, which helps you get the most value from Cisco Small Business solutions, providing peace of mind at an affordable price. Cisco Smart Net Total Care provides a single service platform for all Cisco networking products. With global coverage, flexible contract terms, and multiple advance hardware replacement options, this comprehensive service includes software upgrades, access to the Cisco Small Business Support Center, and extended telephone and online chat support. To learn more, visit https://www.cisco.com/c/en/us/solutions/small-business/services.html. To find out where Cisco Small Business Support Service is available by country, go to https://supportforums.cisco.com/t5/regional-service-support-options/bd-p/4626-discussions-smb-support-country. Multiple language options: The Cisco 250 Series switches are available in multiple languages. Product documentation and user interfaces are translated, giving you the ability to select your preferred language.